We have collected some great ChallahGram stories – it seems that people are having a lot of fun with their ChallahGram experience. They get pretty creative! Hey, if you have a ChallahGram story please share it with us! Let’s start with one of our favorites, the Sandy Story. We were in FL for meetings during the hurricane on Friday and left on Saturday to get back for this one. We opened the office today and I have not stopped laughing from the Challah Gram that was here! It is probably THE BEST gift I have ever seen. It really made our day and I plan to send these to everyone!! You are the best and thank you for giving us all a BIG smile today…we needed it. Thank you R. for sending us this ChallahGram reaction! But wait, you haven’t finished reading about what a ChallahGram can do! It can create jobs! We got a call from a customer requesting to put his résumé into the WOW ChallahGram package that he was sending to a prospective employer. Ok, that sounded interesting! We did it. Guess what? The hedge fund that received the ChallahGram sent out 3 of their own ChallahGrams! That’s pretty cool! What a brilliant idea! I bet the office staff were all talking about him before he even set foot in the office! These are all typical stories we get on a weekly basis. Thanks to our customers we have started a blog with tips on how to create an unforgettable Challahgram experience. Tips range from how to write a gift note? The best time to send a gift? How to maximize the surprise factor of the gift? Or, The best recipes to celebrate your weekend with ChallahGram French Toast. We are here to make sure you have an unforgettable gifting experience! Talking about how customers teach us the creative ways Challahgram can be used. Well, we got an call from the Brooklyn Cyclones, they wanted to gift the WOW Challah in the ball park. It’s the perfect Brooklyn gift! What am awesome experience! Check out our favorite picture from the game. We’ve posted them on our Blog. Now for the mind blowing story that we would not believe if we haven’t heard this story first hand, and met with the individuals involved! For obvious reasons we have changed the names of the story to protect their privacy. Josh a diamond merchant needed to renegotiate his lease with his landlord. Upon hearing that Edward* had a good relationship with his landlord, Josh decided to reach out to Edward and try his luck. Indeed, Edward assisted Josh in the renegotiations, reducing some $50,000 from his lease!! Edward looked Josh in the eye: “Don’t you recognize me? I’m the one in the elevator to whom you gifted a Challah… Didn’t King Solomon say ‘Cast your bread upon the waters, for you shall find it after many days’?! Thank you Edward for sharing this story! Now that you’ve read about the creative ways people are using our , you will appreciate the purple cow reaction. Yes, Judy called the WOW Challah a purple cow! Your asking why purple? Well that got us puzzled too. Until she explained: we are an example of Seth Godin’s Purple Cow. You see, brown cows are boring, purple ones attract attention. Most gifts are boring, they lack an experience. 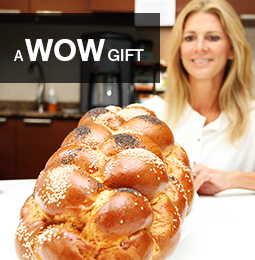 The WOW Challah creates an exceptional experience! Gifting is all about creating a unique experience for the recipient. Not too many gifts create such an awesome reaction as the WOW challahgram. We truly are a purple cow! A standout gift! Thank you Judy for reaching out to us and giving us such a compliment! The stories keep on coming in, so check back some other time for some hot off the press ChallahGram stories!